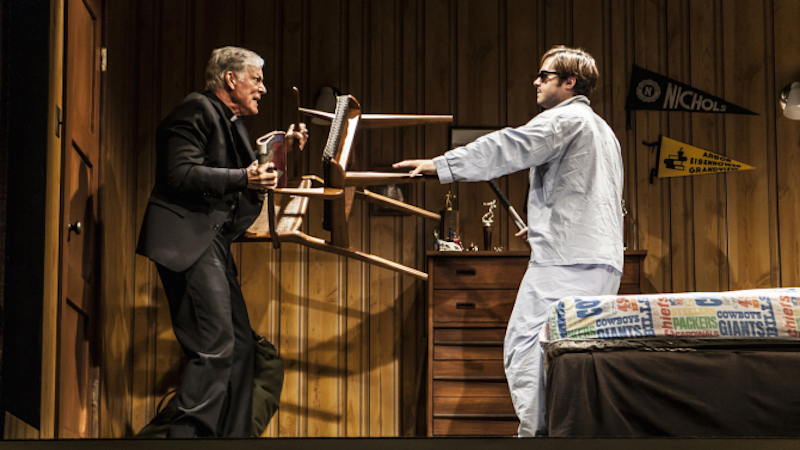 The Invisible Hand and more confront theatregoers Off Broadway. Before diving into the 2014 part of the 2014-2015 Broadway theatre season, let’s look at some of the shows running Off Broadway. In the land beyond the Great White Way, it’s war. Suzan-Lori Parks’ Father Comes Home From the Wars (Parts 1, 2, & 3) has closed at the Public, but is a cinch for regional productions–and there are six more installments to come, as the playwright of the Pulitzer-winning Topdog/Underdog (2001) resets Homer’s Odyssey to the Confederate South, where a guilt-wracked slave named Hero (Sterling K. Brown, excellent) decides to go to war against Union forces with his master (“I am grateful every day that God made me white”). In the second part, Hero debates with a Union soldier who has been taken captive; in the third, Hero makes his way back to Texas, where wife Penny has some unwelcome news. Typical of Parks’ idiosyncratic humor, which has largely been held in check until then, a community of runaway slaves wears contemporary running shoes–and Hero’s old dog, “Odd-See” (Jacob Ming-Trent), talks a blue streak, hilariously. Parks juggles many tones in a panoramic vision, compellingly realized by director Jo Bonney and a fine cast, which accumulates tension, surprise, and passion as it goes–and I look forward to seeing where she’ll lead us. The Tony-winning Sticks and Bones, which was produced on Broadway in 1971, is the shatteringly satirical second part of David Rabe’s Vietnam trilogy, which began with The Basic Training of Pavlo Hummel (a Tony winner for Al Pacino on Broadway in 1977) and ended with the gripping Streamers (1976). Rabe, himself a veteran, offers a despairing, if at times icily funny, vision of the upstanding Nelson family, who find themselves besieged when son David (Ben Schnetzer) returns from Vietnam blind and embittered. Father Ozzie (Bill Pullman, a master at middle-aged decrepitude) and mom Harriet (Holly Hunter, miscast and alarmingly rail thin) go to absurd lengths to tune him out, while younger son Rick (Raviv Ullman) plinks his guitar, chases girls, and is generally oblivious to the situation. While the strain of TV parody, pre-dating Saturday Night Live by a few years, has dated, there’s considerable bite and ferocity left in a play that has somehow sat idle for 40 years, particularly when David confronts a pompous, psychologizing priest (Richard Chamberlain, crisply righteous as a thorny bird of a pastor) in the second act. When the nuclear family reasserts its supremacy toward the close of this harrowing New Group revival, directed by Scott Elliott, it’s chilling–and I was shocked to learn that CBS broadcast some version of it in the early 70s, not without controversy. That the best we can get from theatre on TV today is a mediocre live staging of Peter Pan belies the “Golden Age” we’re screening in. Ayad Ahktar’s gripping domestic melodrama Disgraced, a Pulitzer winner set in post-9/11 Manhattan, is a highlight of the Broadway season. Ahktar’s latest, The Invisible Hand, is quietly unnerving audiences at New York Theatre Workshop, in a crackling production directed by Ken Rus Schmoll. Taking its cue from Adam Smith’s observation about “the invisible hand” of free market forces correcting unruly economies, the play introduces us to Nick (the faultless Justin Kirk), a Citibank executive who, being held prisoner by a terrorist cell in Pakistan, is anything but free. Tired of waiting for the ransom as negotiations stall, his imposing jailer, Bashir (Usman Ally), devises a new arrangement–Nick can use his skills to manipulate the rupee and earn his own freedom once $10 million is in the cell’s accounts. The funds will be earmarked for good works–clean water, schools, and hospitals–but money changes everything, as a recent Tony winner sang in a past incarnation, and the “purity” of Bashir’s dubious cause is sorely tested. While some of the more writerly passages about money and markets suggest a Mideast terror spin on the book and film Cosmopolis, suspense and black humor go hand-in-hand in The Invisible Hand, and kudos to designers Riccardo Hernandez (set), Tyler Micoleau (lighting), and Leah Gelpe (audio) for transforming the space into a convincing penal colony. Gentler, if not quite easygoing, is David Auburn’s Lost Lake, at the Manhattan Theater Club. John Hawkes, the kind of actor’s actor I respect (the one who, despite success on TV in Deadwood and in films like The Sessions, looks like he wandered into City Center by chance and just started in on whatever was going on in the theatre at the time), is the addled Hogan, who owns a crumbling lakeside cottage. Veronica (Tracie Thoms) cautiously rents the cabin as a summer getaway for her and her kids, only to find that, try as she might to shake him off, the pesky, if helpful, Hogan comes with the premises. Needless to say, a wary friendship forms, as the two sort through each other’s personal baggage. 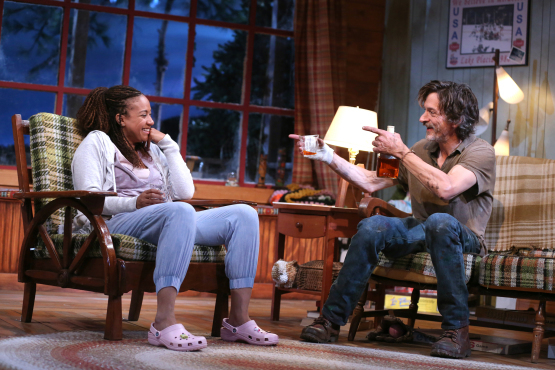 Auburn’s burden is having written the hugely successful Proof, a Pulitzer and Tony winner, 15 years ago–Lost Lake, a slight, 90-minute two-hander, is the sort of show that should come before such accomplishment. The new play has debuted in the same space as Proof, a reminder of MTC’s past glories as it spins its wheels with a few too many complacent plays like this one. But it is up to the company’s usual high standards in acting, direction (Daniel Sullivan), and set design (in this instance, collapsible, and the work of J. Michael Griggs)–and it does take a little of the chill off one’s bones in a war-torn season thus far.